Need Some Blue's Clues Birthday Party Ideas? Blue's Clues Birthday Party Ideas...Lot's of good ideas to help your party be the best it can be. Kids just love Blue's Clues! For many young children, "Blue's Clues" is the high point of their day. 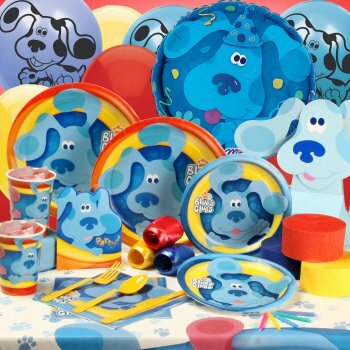 Why not have a "Blue's Clues" party for your little one! A stuffed blue dog can be your centerpiece! You can bake and decorate your own Blue's Clues Cake or cupcakes. An easy cake idea is a round cake with 4 cupcakes. What is it? It's Blue's Paw! Thinking about entertainment? Hiring a Blue, Magenta, Salt, Paprika, Pepper, and any other "Blue's Clues" characters could be an interesting addition to your party. Activities and fun party games are easy to match to your "Blue's Clues" party theme. Here is where to get your Blue's Clues free printable coloring pages. No matter what activities or party games you decide to use, the children in attendance will love this "Blue's Clues" party that you have put so much thought, love, and fun into.